Screw fashion trends, let’s talk brow trends! I know it’s LFW but I’ve never been particularly fashionable. I like clothes, a lot. I like to buy clothes, a lot. I just don’t know how to combine them to ‘create’ looks. I’m truly envious of women who have an unforced style… me? If it looks good, it tends to look like I’ve ‘tried’ really, really hard to make it look good you know? So anyway, it’s not that I’m eschewing LFW… not at all, I love to look at the makeup from the shows… but when it comes to trends? Completey superficial and frivolous posts on eyebrows are more my thing! With this in mind, brow gods Tweezerman reckon they’ve got their fingers on the Brow Trends that’ll have us going “ooh nice brows” this Summer. Don’t say that I’m the only one who “oohs” over nice eyebrows in this way… no seriously, don’t. [stextbox id=”custom” caption=”Tweezerman say…” ccolor=”ffffff” bcolor=”b0c4de” bgcolor=”e6e6fa” cbgcolor=”b0c4de”]Brows – last season it was all about an over sized, wild & bushy brow. This season, full brows are still on trend but now they are more tailored & groomed, the hairs aren’t as wild and often they are slightly elongated and tapered at the ends creating a touch more drama. Strong brows are still in, just a little more ‘tailored’! 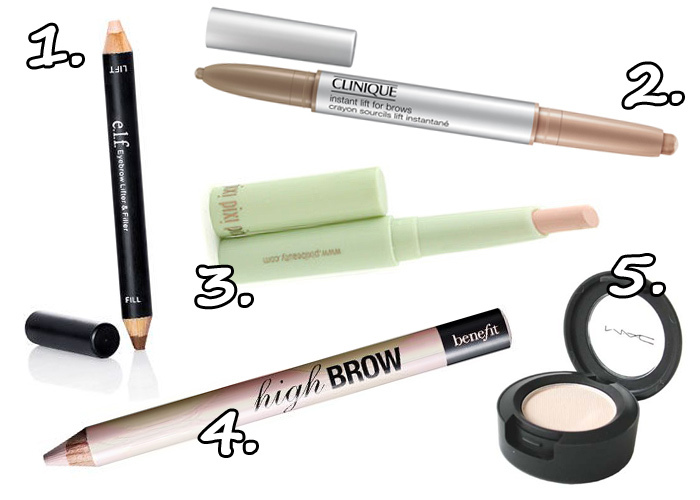 Here are some of the most popular products on the market for emphasising a beautiful brow! But what my eyebrows want to know is this… how long are they going to have to wait until curly brows are in huh? Well in that case, I’d better stock up on mega-hold hairspray and hone my use of brow shaping scissors instead. Do you have brow envy? To be honest, I don’t follow brow trends. 50s style brows – very much like the ‘in’ photo – suit me, and if I play around with it too much I just look a bit odd. Really want to try the Clinique Instant Lift! Complete and utter brow obsessive, for me they totally make or break a face. My daughter is forbidden to pluck her own – you cant shape if you cant see, mummy knows best and I do hers in my total control freak style! I have spent a very long time honing my brow drawing skills as my natural brows are pathetic, but it has paid off in recent weeks 4 different people have commented on how nice my brows look so am chuffed with that! Yours have been undergoing some serious work and its quite apparent in your fotd and lip pics, whilst you might have to beat them into submission they do look bloody brilliant. Can I share? I actually have “brow crushes” *hangs head in shame* Sela Ward who plays Hugh Lauries’ in House omg her brows are amazing. And I am tragic. And leaving now. I have curly eyebrows too – well, more specifically, a curly eyebrow! It gives me a wonky face. But I don’t worry too much about it – I remember an old gentleman whose eyebrows were so curly that if you stood to his side, you could see through them, like tunnels for the brow bones (he was an old teacher of mine). Until I get to that stage myself, I am not so worried! I have complete brow envy! Oh I defenitely have brow envy. At the point where brows are supposed to arch, mine just stop. And I love big bold arched brows, thus I draw them on every day ever since I was 13/14 years old. I think my brows look fine and people compliment me on them, but I just wish I had the eyebrows I pretent to have, hehe. hooray for strong brows! yes i love them. Could not care less about brows. Except I don’t like heavy ones. Those ladies above look very masculine. Kinda freaks me out. Barely-there is best. Haha, I have curly brows too. Oh well. I wear my brows 100% natural, so I own zero brow products. Oh, I have total brow envy! Mine naturally grow in different shapes — one is kind of straight and the other arched — and they’re shorter than they should be! I’ve never followed brow fashion, it’s a bit hard to not look an idiot if you’re Indian. Can you see me prancing around with bleached blonde brows? I’d scare more than I’d impress. I also didn’t follow the razor thin brow look, I’d look like an orange with eyebrows. However, my various eyebrows ladies over the years have messed my brows up so I’ve gone from super thick to super thin but now I’ve found a shape I like. However, I went to a new lady the other week (Was in a bind) and she messed them right up, I refused to pay and was left having to pencil the thinner one in and have to let them fully grow back..they’re taking their time this time as usually they grow super fast. I find that using my MUFE Full Cover concealer on the brow bone is a quick and easy way to highlight the area, and it doesn’t move or look oily during the day like some other products do. Eeee. I hate eyebrows like the ‘Out!’ picture – they’re not strong, just tragic. I’m eyebrow OBSESSED. Have been since year six when my teacher’s dodgy eyebrows annoyed me and I kept picturing filling the gaps in ahaha. I think well groomed brows will always be in fashion! Only clean brows for me! I’m scared of overly bushy brows and I don’t like brows that are too thin. I love MAC Lingering Pencil to fill the brows and MAC Pearl Cream Colour base or Shroom eyeshadow to highlight the browbone! I’m a little brow-obsessed too, and my brow lady usually does a nice job of giving my straight Bert from Sesame Street brows a shape, but this time they were still straggly afterward. My biggest lament is their color, which is about as dark as Camilla Belle’s, only thinner. It doesn’t jibe with my fair skin and I’ve wanted to lighten them so badly, but nobody will do it around here. My brow person tells me dark brows are the envy of other women, but I disagree. They look manly and harsh on me. Honestly, I have massive brow envy. Mine are naturally rather wimpy — sparse, blonde and uninteresting. But naturally, each individual hair is LONG and if unattended I could possibly look like a cave-dwelling creature from a sci-fi film and use my brows as antennae. So, I have no need to tweeze and just try to trim them into submission. Still, I’m so envious of those with full, thick brows. I really wish I could get a brow makeover by someone in the know. They need help, desperately. I like seeing the different types of brows on others but I don’t follow trends. 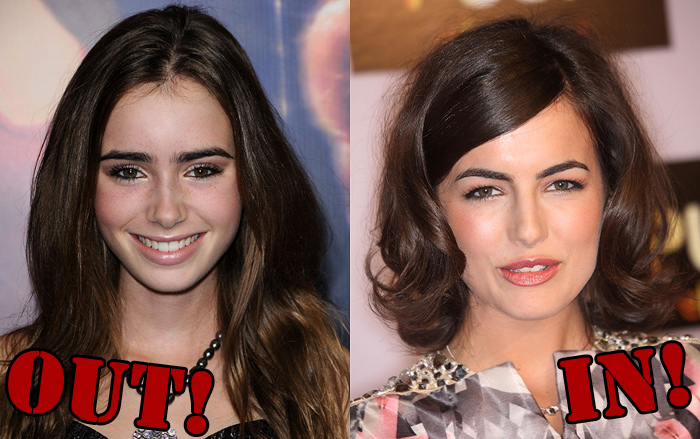 Personally I love full brows (Camilla Belle has gorgeous brows). I have naturally thick brows and try to keep my natural shape but last year the ends got a bit thinner from having them over-threaded so I am trying to grow back the ends. ARGH I HATE brow trends! It’s one of the few bandwagons I simply cannot jump on. When you’re not naturally blessed with Keira K’s thick dark brows and start filling them in on your own, it starts to look very unnatural. You can’t go from light to dark in 0 to 60! I shall simply have to look enviously on the fashion models and actresses who are able to rock this trend. I so wish I could jump on this bandwagon, but my brows just aren’t thick enough do anything with them… They’re dark and wiry, and were naturally quite thick, but they’ve never grown back properly ever since a college incident incolving passing out and being attacked with a razor…! There’s some left to work with but they’re just not big enough to change the shape, if you know what I mean – so getting them professionally done just seems like a waste – I don’t know what else they could do but make them thinner, which I don’t want! *Sigh*. Anyone esle with this issue? I tend to just get my brows waxed as I love my natural shape and they just need some clean up. However, I use a soft black brow pencil to define them, then use a brush to make sure the color looks even and natural. I like defined brows and I really love how they can frame your eyes/face. So I can’t follow brow trends at all, nor do I want to. I just want more brows so that they’ll show up in photographs when I don’t have makeup on. There are quite a few Mona Lisa style photos of me out there. I don’t know if its her hair or her brows in the ‘in’ picture but they look heavy. Like her brows are pushing her face down. Not like. I have curly eyebrows too!! Michelle, I thought the same thing too – my brows are dark and wiry and were left much more sparse after too much plucking in my early 20s, but when I found the girl who does my brows, she was actually able to shape them. I thought it was impossible, but it proves you just need to find the right person. Also, RapidLash really helped grow the ends of my brows in. It didn’t give me Camilla Belle’s, but there was a definite improvement because the ends used to be pretty bad. It’s expensive, but I’ve found it lasts a long time. Thanks Taryn – perhaps it’s worth a try finding someone then – perhals there is hope for my brows yet! I’m sure there’s a brow bar in Selfridge, I might ask in there – I assume they must know what they’re doing! I don’t have enough brows to justify plucking. Seriously — I’ve tried and had estheticians turn me away! Without colouring them in you can hardly tell I have eyebrows at all, so trying to shape what’s there seems like an exercise in futility. I have to draw my brows in EEEEVVVERY day. I aim for ones like the “in” pic but it takes too long!! I’d have to dye my eyebrows to see-through to get that! I don’t follow brow trends; I find my eyebrows to be rather wonderful the way they are. I was born a golden blonde (now a peroxide blonde) with really dark eyebrows, and I find they add character to my face. I do appreciate nice eyebrows, but trying to imagine myself or anyone I know with these eyebrows really doesn’t work for me! I have a beast of a mono brow that I could probably trim daily. This trimming malarkey is a real pain.